On the very slight chance that you haven't seen this guy's work, you really should give him a visit. 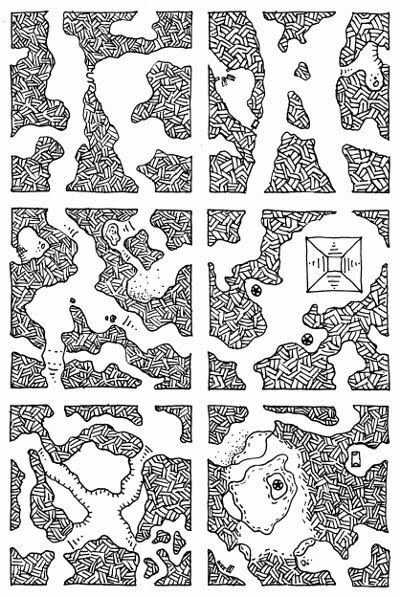 Dyson does the coolest dungeon geomorphs. I recommend them — and him — most highly. He pumps out a new tile every day or so (usually) and colllates them into weekly sets like the ones to left and right. To be completely honest, I can't say that I've made any real use of them myself as yet. 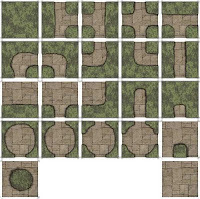 But the idea of a geomorphic tile-based dungeon appeals to me as a planning aid, and I really should get my act together to print them out on card and start shuffling. Some while ago, I sent my players up against a wizard who had, as a defence for his lair, a moving strangler-vine hedge maze. It shifted when nobody was looking, so unless there were enough people in the party to keep their entire route under direct observation, they could never be sure that things would be the same if they had to retrace their steps. 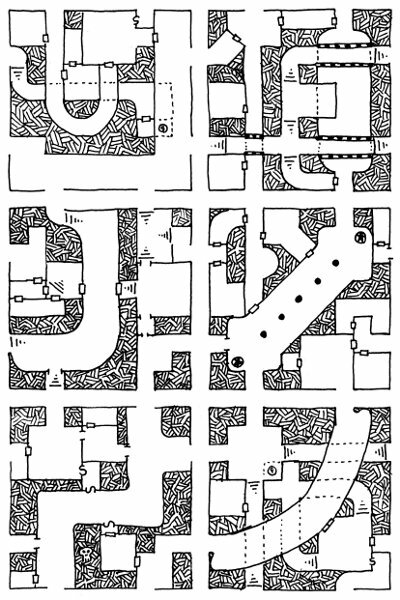 The maze is not a barrier, but a trap – anybody entering without the appropriate passkey should end up wandering aimlessly until they starve to death, are killed by any of the various denizens of the maze, or are retrieved by the wizard for use in various nasty experiments. I decided the easiest way for me to run this would be by randomly drawing from a set of geomorphic tiles as the party moved through the trap, and to that end I designed this tile set. There are, I found, a few useful tile configurations missing; I may (or may not) get around to filling those in one of these days. 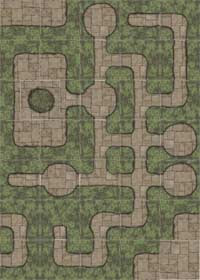 Each tile is about 170mm square, and is superimposed with a 25mm hex grid. You can grab a PDF of the whole set here (approx. 2.41MB). As it turned out the party managed to get through by a combination of accident and brute strength – one party member was partially petrified and enormously enlarged, so when she fell down under her own weight she took down many of the hedges as well, and being mostly stone, she was immune to the constriction of the strangler-vine. That got them most of the way through, and gave them the idea of using tubes (I don't actually remember where the tubes came from) pushed through the remaining hedges and enlarging them enough to crawl through. As some of those who have read the wargaming section of my website will be aware, I like to replace the barrels of my microarmour with sturdier wire replacements. With simple barrels, lacking barrel-sleeves or muzzle-brakes like the 3-pounder of the Vickers Medium Mk.II it's no big deal, but for more complex barrels like the 88mm of the Tiger I shown here, things get a bit more involved. The photo to the right shows a 1/285 scale Tiger from C-in-C. The one to the left has had its barrel replaced, and the one to the right shows just why I like to go to all this trouble to do so — the metal these miniatures is cast from is very soft, and gun barrels are very vulnerable to damage. A soft, bendy, drooping gun barrel is just too Freudian to be permitted anywhere near a wargames table. My favourite barrel material come in the form of 16mm brass sequin pins, about 0.65mm thick. They're soft enough to be able to work easily with files and wet-&-dry emery paper, but stiff enough to be reasonably resistant to inadvertant bending. 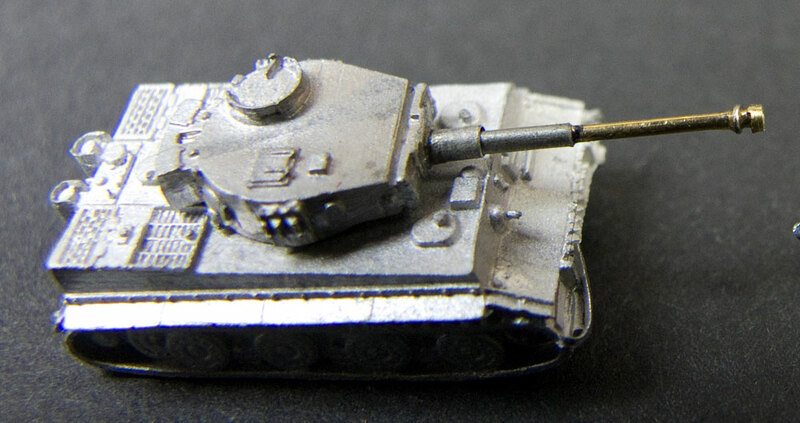 A 16mm pin is just long enough for a Tiger I's 88mm, which is about 11.5mm long in scale; I'd have to source some longer pins for guns like the 88L71 of the Tiger II or the Elefant, or the long 122mm guns of the later Soviet tanks. I start by mounting the pin in my Dremel and working the head down to a square ridge with a fine-toothed file. The muzzle-brake is built up by wrapping a piece of fine wire around the pin and sticking it in place with super-glue gel. The muzzle-brake is more of an indication than an accurate portrayal of the specific type used on this gun; now that I come to look at it, I could probably get away with taking the pin-head right down flush with the shaft of the pin and building up the cone of the brake with a ring of wire and gel glue. The sleeves are made from lead foil salvaged from a wine bottle. The foil is wrapped around the pin and secured with super-glue — the hardest part about it is getting a close, even fit; I expect it's something that gets easier with practice. At least, I hope so. You do have to be a bit careful to make sure that the seams are hidden away on the bottom, where nobody will see them. Note: I've seen this done with cut-down hypodermic needles; they come in a pretty wide range of gauges, and its possible to get tubing that fits together like these foil sleeves. The effect is very good, and being tubing there's no seam. Unfortunately I have no idea where I'd go to get them, nor how much they'd cost. The resulting gun replacement is a little more massive than the original, which was modelled closer to actual scale. However, in this case I think that's an advantage — it makes the gun look more impressive, as an 88mm should be. This first one took a while — maybe an hour. I expect that time will drop with practice and some sort of production-line process, but even so it's not a quick-fix job. Nevertheless, I think the effort is worth while. A while ago, my longest-lasting character, Sir Fnord the Totally Awesome (I've been playing him off and on since '81) managed to fight his way through an army of demon-cultists and an avatar of the Demogorgon to a hoard of millions and millions of gold pieces. 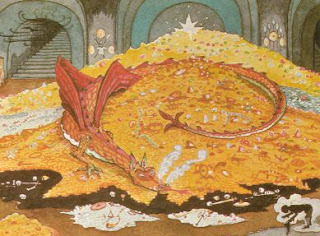 That's a lot of gold pieces. Prior to that, the game had revolved largely around scrabbling for enough cash to survive and (hopefully) to replace vital equipment, with the occasional windfall allowing us to break loose once in a while. Though never really at starvation levels, it was a pretty hand-to-mouth existence. Suddenly having effectively unlimited financial resources changed the nature of the game quite substantially, because it removed at one blow the major motivator for the party up until that time. All of a sudden we were on the Other Side. Now we became just the sort of juicy target we'd been looking for before we became ludicrously wealthy. It also meant that all of a sudden, we had to think about what it was that we wanted from life, instead of just going with the flow and reacting to circumstance, and hoping to survive. So where am I going with this? What I'm pondering on is the issue of character motivation. When the characters are poor, motivation is easily attained by the offer of a potential material reward. Even for supposedly upright and morally uplifted characters like paladins, getting money and magical gee-gaws is the main aim, and moral or ethical issues tend to be sidelined. It's a pretty simple matter for the GM to shunt the party from one dungeon to the next, and his or her main problem is to keep the party poor enough to make them readily manipulated. They can increase the potential rewards to overcome the chicken-heartedness of the players, but that risks falling into a Monty Haul spiral; exactly the same problem will recur, and it will only get harder to deal with. They can start laying track for a railroaded game, but that's an inelegant solution to say the least. The players will tend to feel manipulated and may become unsettled and rebellious, and the GM is likely to come to see his players' characters as glorified NPCs. They can rob the party and make them poor again. This can work pretty well, even if the party aren't reduced to absolutely pauperish levels, because if there's one thing players hate it's having their precious stuff nicked, and revenge is a powerful motivator. This is a good opportunity to introduce a recurring villain, a Party Nemesis, somebody they can really get into hating. It can add an ethical dimension to the campaign if the Nemesis is not actually a Bad Guy, but frankly for most parties it won't matter a damn whether he's evil or not — they'll still cut his gizzards out for having the effrontery to steal the most worthless of their posessions. They can remove mundane wealth from the equation completely, as was the case with Sir Fnord, and throw the issue of character motivation back into the laps of the players. This can be risky; there are quite a few players who really don't want to have to make those sorts of decisions, and it may make them a tad uncomfortable. There are, no doubt, other options available to the GM, but those are some I can think of off the cuff. Of the four options I've delineated here, number 3 is probably the most useful I think. It leaves the GM with a good deal of control over the development of the game, and a recurring villain is a very useful source of plot hooks for later on down the track when one is feeling a bit uninspired — just reintroduce the Nemesis and watch the party respond like a rabid pack of Pavlov's dogs. Number 4 is a good option if you feel that the party is getting into end-game territory since it provides an opportunity, for those who want to, to semi-retire their characters. New characters can be introduced as the old one's henchmen, guarding their master's huge wealth and so on. And for those who don't want to retire, not having the aquisition of money as their primary motivator means they can start concentrating on the ethical and philosophical development of their characters. There are a couple of D&D combat-related things I've read on message boards and blogs lately that intrigued me. First, somebody pointed out an obscure rule buried deep in one of the manuals (the DMG? I don't recall exactly) that suggested that in a multiple-opponent melee, the actual enemy attacked should be selected randomly from all those within reach. The rationale, as I recall, was that the one-minute combat round encompassed and abstracted a great deal of maneouvre, feints, parries and blows, and that the nature of hand-to-hand combat is such that it is seldom possible to concentrate on a single opponent and that attacks are made whenever an opportunity arises as the combat moves to and fro. I've never (consciously) read this rule, and I don't know if it is meant to apply to PCs as well as NPCs and monsters, but it does seem to me that it suits an abstract combat system. It would make it harder to work systematically through a group of opponents, since one couldn't be sure that one's attacks would be directed against a foe one had already damaged. If fighting alongside comrades, the party wouldn't be able to reliably spread their attacks among the available targets. What I like about it is that it would make combat less mechanical and predictable. What I don't like about it is that it removes a degree of tactical control, which is not neccessarily to everyone's taste. 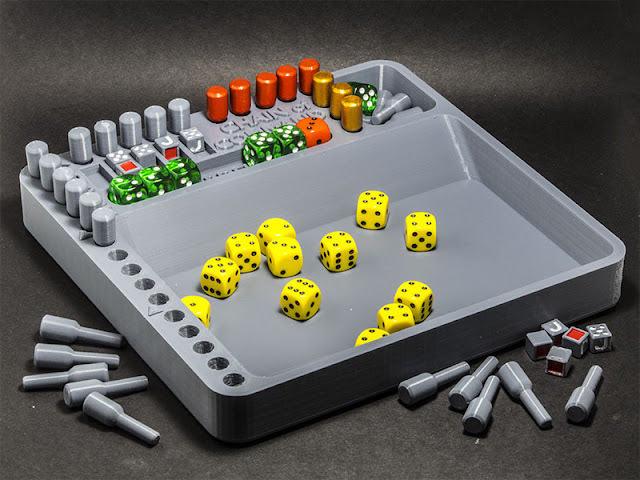 I find the idea intriguing from a game-mechanics perspective, but I don't know that it would actually make playing more fun — and that's really the aim of the game, after all. I think, if I were to adopt this style of play at all, I'd probably tend to use it in a miniatureless combat situation, and I'd modify it somewhat so that a character could concentrate on a specific foe at the cost of an AC penalty against any others. Another thing that interested me recently is the idea of doing away with the attack roll, as proposed by JB on his B/X Blackrazor blog as a means to radically speed up combat. It's an idea that seems to me to fall into the same camp, conceptually, with my ideas about doing away with the initiative roll. He points out that when a magic-user casts a spell at somebody, there is generally no to-hit roll required and the victim (usually) gets to modify the effect with a saving throw. He suggests that a similar sort of thing be applied to physical combat — I'm over-simplifying enormously here; it would be a good idea to go and read his actual words (there are a couple of other of his posts that expand on the idea; the one I've linked to is the first of the series). Again, this is an idea that I think suits a highly abstract combat system, but I don't think it's an idea that many players would find all that attractive, for one main reason: people just love rolling dice. They may complain that playing out combat takes too much time (though in truth that's a problem I've encountered more in other systems, not so much in D&D) but when it comes down to it, they like the suspense of rolling a die and seeing whether they succeed or fail.